The AutoCAD 2009 features continue! Now it’s easier than ever to view in 3D. 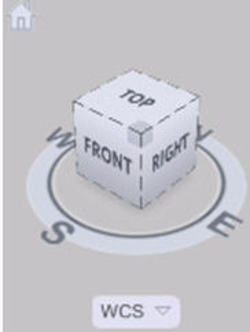 The new CUBE command displays the very intuitive 3D navigation cube. This interactive ViewCube becomes active when you move your cursor over it. Hotspots highlight as you pass your cursor around the cube. Click on a hotspot to restore the associated view. It’s easy to grab the ViewCube command from the View panel on the Home tab (3d Modeling Workspace must be activated). Note: The ViewCube is only available when your drawing is set to any 3D visual style. Tip: Pick the house icon on the ViewCube to quickly return to the home view. The home view can be set from the shortcut menu. 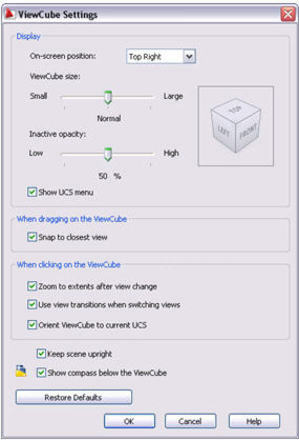 You can control many aspects of the ViewCube from the ViewCube Settings dialog (available by right clicking on the cube). And rumor has it you'll be seeing this cool viewcube in many different Autodesk programs so you'll be able to quickly navigate in 3D regardless of which software you are using!